Apply generously morning and evening, ideally after showering or bathing. This product comes in an uninspiring bottle. It has a pleasant fragrance but it is not a product that I would have selected for myself. The mid-textured cream moisturises well but needs a few moments to be absorbed by the skin. I got this in a set with a perfume and body wash, all of it has a wonderful scent that is nice. The lovely scent is the best factor about this lotion for me. The smell is so lovely and long lasting. The consistency of the lotion is not too thick or thin just right,it absorbs really well into my skin leaving me with soft lovely smelling skin. 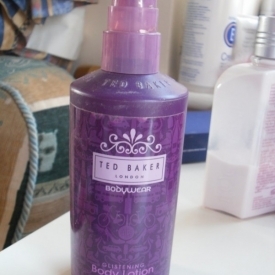 A lovely scented body lotion! I use this body lotion every day after showering or bathing and I love it. It absorbs really easily and smells gorgeous. Unfortunately though it has been discontinued.